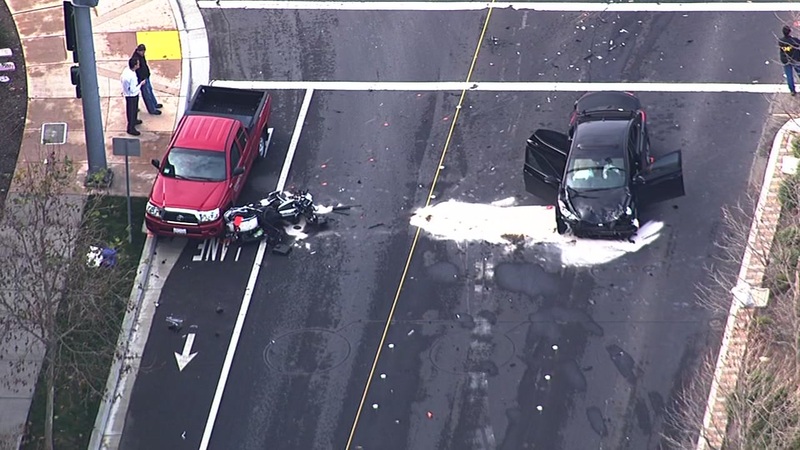 DUBLIN, Calif. -- A Dublin police officer suffered a broken leg when a car fleeing California Highway Patrol officers hit his motorcycle this morning, a CHP spokesman said. A car reported stolen out of San Jose was spotted on Interstate Highway 580 around 9:30 a.m., CHP Officer Derek Reed said. The officers followed it and tried to pull it over near the Highway 580 and Interstate Highway 680 interchange. The driver of the car sped away onto I-680 and then onto Dublin city streets. The CHP officers called off the pursuit, following the car from "a great distance" behind, Reed said. The fleeing driver then tried to make a U-turn on Dublin Boulevard near DeMarcus Boulevard but hit a Dublin police motorcycle officer who was arriving to assist. After the crash, the four occupants of the car all got out and ran from the scene, Reed said. The car's driver was quickly caught but the other three temporarily escaped. CHP and Dublin police officers set up a perimeter to search for the remaining suspects. They were caught in a neighborhood a short time later, Reed said. The police officer was taken to a hospital to be treated for the broken leg. The four suspects, all San Jose residents, have been detained. The driver will be arrested on suspicion of felony evading police and possession of a stolen vehicle, while the other three occupants will likely be facing charges as well, Reed said.